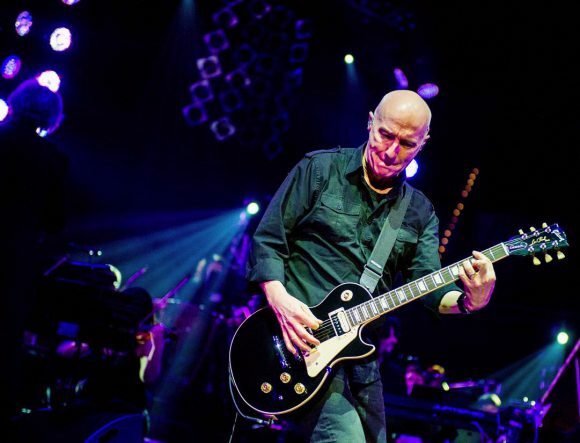 Midge Ure fans: There’s a special treat for you as Ure visits Seattle this Friday, January 6th. The brilliant Scottish singer-songwriter headlines the elegant Triple Door with a full band, featuring an extremely cool set list. I won’t post that list here (some of us like to be surprised), but if it stays at all similar to other shows I’m seeing the set lists for, we will have a fantastic night. We all know that Ultravox, Ure’s best-known band, was exquisite. Pay attention as well, however, to Ure’s solo material. While it differs from Ultravox, it’s awesome on its own. Ultravox is a band there’s never any chance mistaking for any other. It stands today as a hugely individual band that’s had influence even in places you might not expect. Ure’s voice and guitar playing skills – plus bringing keys and particularly synths into bands (I don’t know of many other musicians who straddled guitar and synths so early and so well) – helped make Ultravox one of the big new wave bands. Go forward a bit and Ure became a power for social good when he co-wrote “Do They Know It’s Christmas?” with Bob Geldof, which led to Band Aid and Live Aid, which led to an ambassadorship with Save the Children. And he’s done other cool things, like performing at Prince Charles’ Rock Gala, and competing in Celebrity MasterChef. Also he’s written an excellent autobiography called If I Was. Recommended reading. It’s not every day I get to pepper with questions someone who has written music holding such a special place in my musical heart. I need to say a big thank you to Midge Ure for answering those questions. I mean, Ure was in Thin Lizzy and Visage as well. Wicked! Q: What is it about Ultravox that has made them so unique? Midge Ure: We never let ourselves be dictated to or dominated by the label. We used whatever instrumentation to make what we thought to be interesting music. Sometimes that was commercially successful and other times not. This ended up giving us a ‘Blade Runner’ effect where you couldn’t tell if we were futuristic or steeped in the past. Q: You grew up in a pretty tough area of Scotland. How did that prepare you for the music world? MU: I think Scots have a natural thick skin which is the best preparation you can have for entering the music business. Q: What are some of your favorite things to cook? Have you learned any new recipes? Q: You worked with Kate Bush on Answers to Nothing’s “Sister and Brother.” How did that come about, and what are some memories of that experience? MU: Kate agreed to do something on ‘Sister’ during a party at Prince Charles’ place at Kensington Palace. I sent the tapes to her studio expecting not to hear anything from her for quite a while as she was in the middle of recording her own album. Kate contacted me a few days later and asked if I wanted to hear what she had done. I went to her studio and almost wept when I realised she must have spent hours working on her brilliant multi-tracked vocals. A true genius. Q: What were the most difficult parts to write in your autobiography? Why? MU: All of it. Mourning for the loss of the ‘halcyon days’ or celebrating the fact I stood strong against pressure from all around me to do ‘dance/DJ mixes’ etc. in order to have commercial success. It is a painful journey raking over your past. Q: You had that wonderful Burberry trench coat for the “Vienna” video. Do you still have that? MU: I do have that still. It’s the first thing I bought when I first earned any money. Every other piece of clothing I owned came from thrift shops. Q: What do you remember singing as a kid? MU: All the time. It didn’t cost anything and for me it was just natural. Q: What band have you heard Ultravox’s influence the most in? I read one interview where you mention Muse. Who has done it best? MU: Music should be something you make your own, then hand it on, hopefully inspiring someone else to take your influence further than you could. We are all fans/inspired by others. Thats how it works. I can hear little bits of Ultravox in many bands. Q: Were you aware the song “Vienna” (and the accompanying video) would be so massive, and what do you remember about writing the song? Was the video fun to make? MU: We knew we had something interesting but had no idea it would resonate the way it did with the public. Artists make music but turning that into a commercial success is down to a wealth of other people. The video was great to make although we had to get a bank loan to do it as Chrysalis, our label, didn’t see the point of making a video clip as the record was number two in the UK charts at the time. Q: What are a couple of your favorite bands from when Ultravox came out? What is it about them you like? MU: Magazine were great. They walked their own line musically. Japan were also unique. The music and in particular, Mick Karns’ bass playing was thoughtful and intelligent. You had early success in your career, even before Ultravox. How do you think that affected your approach to your later success? Q: What have you learned from having three daughters? Have they inherited your musical talent? MU: I have four daughters and they all have music pumping through their veins. Tickets and all the details are available here. Written by: Dagmar on 01/03/2017. This entry was tagged midge ure, posted by dagmar, ultravox. Bookmark the permalink.